In the final months of writing my PhD I was invited to organise an exhibition using the three main cabinets in the foyer of the department. As part of a wider Adaptable Suburbs research project my PhD entitled ‘Making the Local’ looks at the ways in which people consider and engage with their locality, particularly the built environment and how such engagements are both a product of and produce what I call a ‘local’ subjectivity. My interests had led me to the Seething Villagers, a large and loose collective of people who regularly engage in community activities so as to develop a place where people can play, get involved and ‘really belong to meaningful community’. 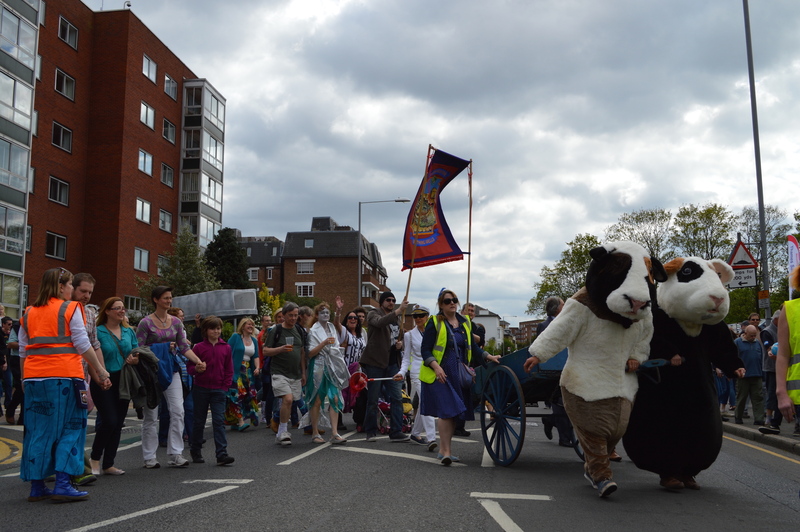 The ‘Villagers’ hold numerous festivals; parades and events in and around Surbiton based around the legends of Seething. The core legend tells of Lefi the goat boy and how Lefi was excluded from the ancient village of Seething for being different—being half goat, half boy. However, after ridding the village of a violent giant, Thamas Deeton, through cleaver trickery, the Villagers came to realise that they had been nasty to Lefi and learnt that inclusion and love is better than exclusion and hate. The various Seething legends, such as the The Tale of the Last Sardine, The Kings Soup, Jack and the Golden Egg (See Hutchinson 2002a, 2010b, 2011, 2012) all have their own festival dates and are derived from the central Lefi story. The stories take various forms but all share the themes of inclusion, mutual participation, finding joy in sharing, and in community. The stories are remembered through a number of books, regular public readings and theatrical re-enactments at public events. These events include the making of a collective soup in a local park, the fishing for Seething sardines in the nearby River or the parading of Thamas Deeton the giant through the streets of the suburb. The legends also change and evolve over time as people ab lib the histories in the process of living and being Seethinger. The Seething events not only acknowledge this imaginary, but actively play with it, turning it into the antidote used to counter the notion of Surbiton as a place without life. I’m not suggesting that the Seething legends are fiction but consider the fact that if suburbs have no history then one can be made up. If it is made up then no single person can be an expert. If there is no expert then everyone is equally able to participate: regardless of birth, family ties, how long one has lived there or even if the person does not live there at all. Seething is summed up best through a t-shirt often worn by Seethingers that declares “I live in Seething – it’s a state of mind”. 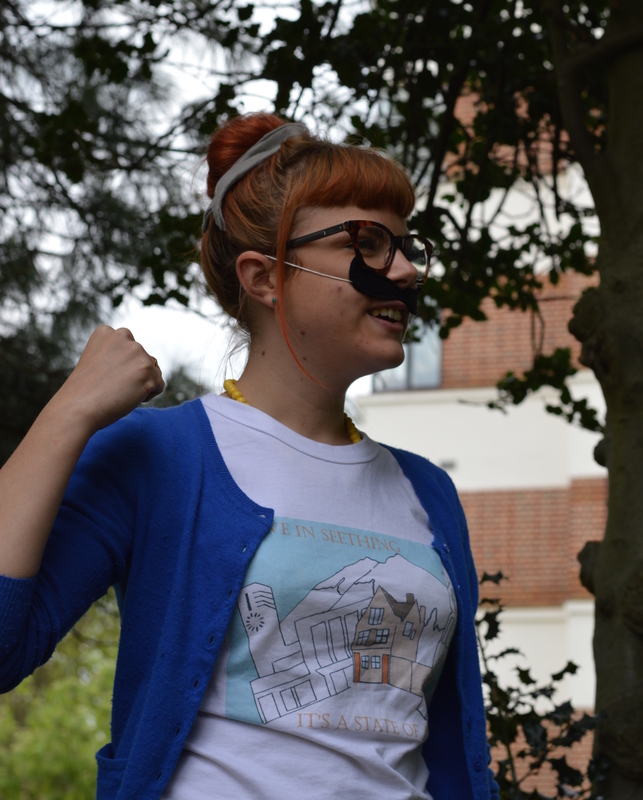 Image 2: Seethinger wearing ‘I live in Seething – it’s a State of mind’ t-shirt (Photo Credit: Authors own). When someone steps into that state, they are confronted with a choice. For example, imagine that you, even as I was, are standing in the local pub garden. You are told that the pub garden you are standing in is the site of Mount Seething which was destroyed by the angry Giant Thamas Deeton as he stormed out of Seething for the last time. This fact is further verified by a second person who points to the lack of a mountain as proof that the mountain was destroyed. Rather than incredulity, this assertion is met with a general exclamation of ‘FACT. As this unfolds, one is presented with a choice. Does one believe the story and start to embellish it, ask questions and give insights such as ‘maybe that sandpit is his footprint! ?’ or does one simply set aside the nonsense and participate only in serious pub conversations? The obvious course is to engage, start to play, invent laugh and in so doing one includes oneself in the present unfolding of Seething history. As an ethnographer I lived as a Seethinger. When telling other anthropologists of Seething I would present a blend of fact and fiction and leave the choice to whomever I was telling the story. The cohort of my fellow PhD boasted an incredible and rich range of subject matters: from how people dealt with the social implication of surviving breast cancer in India to studying the role of new social media in China. A few months into my fieldwork period I passed Tom, a friend and colleague, in the entrance to the department. I had told him of street parades with the Giant Guinea Pigs of the Apocalypse, legends of giants and how the Free University of Seething (FUS)–the oldest university in the world–was established after I asked if I could conduct my ethnography in Seething. I lectured in a local pub and FUS became, and still is, a mechanism through which to share knowledge and learning in the community. Walks, events and talks were (and still are) given. Degrees are handed out and FUS will also conduct an oral examination of my doctoral work. Tom asked quite seriously “isn’t your fieldwork just a load of fun?” to which I replied “yes” not quite sensing the implication that, perhaps, fieldwork should not in fact be this silly. But it was silly, very silly. On many occasions Seething Villagers had described the events as ‘silly’, ‘daft’, ‘non-sense’ and ‘stupid’. Being stupid was a crucial aspect of the way the events worked. The Oxford English Dictionary defines ‘stupid’ as the lack of sense. The Seething events are what I call almost stupid. Whilst the legends and myths are a recently discovered, and are a constantly emerging history, their fantastical qualities do, in small ways, play with and re-align popular conceptions of the suburb. Seethingers assert a vision of their suburb which counters the cultural imaginary, one that is full of life and where the local community is deeply engaged in the development of social life. The council have fish as the nobility of Royal association, power and rule, ownership of this part of the Thames: ‘We conquer you with our Bridge’. It’s symbolic of their will to rule us subjects not just govern us. We can’t do it on our own, consensually. Instead, we have to have our Royal chums close by to instil fear and to help subjugate those we rule. 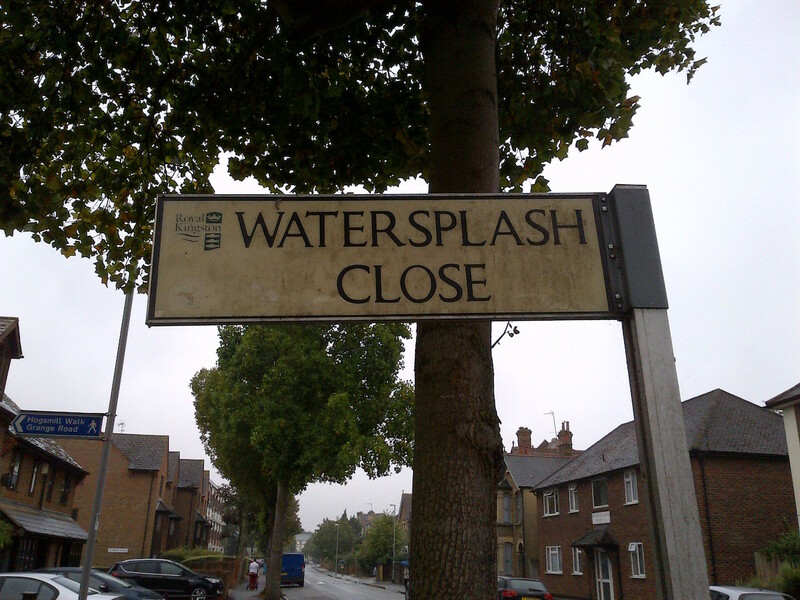 … whereas we [Seething villagers] have it as part of folk memory – the once great freshwater fishing community, thriving on its relationship with nature and the democratic Thames – that’s not about the literal past, but symbolic and anticipatory community future that was and once more can be. We look forward with our fish, whereas the reactionary conservative council look back – with a prominent fish in the ‘coat of arms’ that is more martial than social we hope to recover what they believe has been lost [that is: togetherness, love and balance]. This too is totally different from what the council believe is lost, the council is civic-above-citizen – ours is more inclusive and wants it to be civic-for the citizen. Image 3: The Crest of the Royal borough of Kingston upon a local street sign (Photo Credit: Authors own)..
Seething revels in what it is not. It is not a centre of governance nor does it have a place in the records of ancient history. Seething takes these aspects of not being this, and not being that, and highlights the gap in the accusation levelled at suburban life ‘because it does not have these things it is not a meaningful place’. In doing so, it uses that very same accusation to insert, demonstrate, display and develop community, life and in their words ‘brilliance’. Image 4: The Seething Freshwater Sardine Parade (Photo Credit: Authors own).. Playing in the gap is more assertive than antagonistic; it is playful, open to all and constantly unfolding. To be Seething is not to tell a tale of what was, but is rather to get involved in making it in the present moment. The very ambiguity of its legends and FACTS invite play in the performative present moment. Participating in the constantly evolving stories draw you into a Seething ‘State of Mind’. Using playful participation as a methodology, it made sense to design a Seething exhibition for the front foyer of the Anthropology Department that worked with objects from the Ethnographic Collection inorder to draw out fruitful parallelisms between Seething’s creative project and wider human social practice. 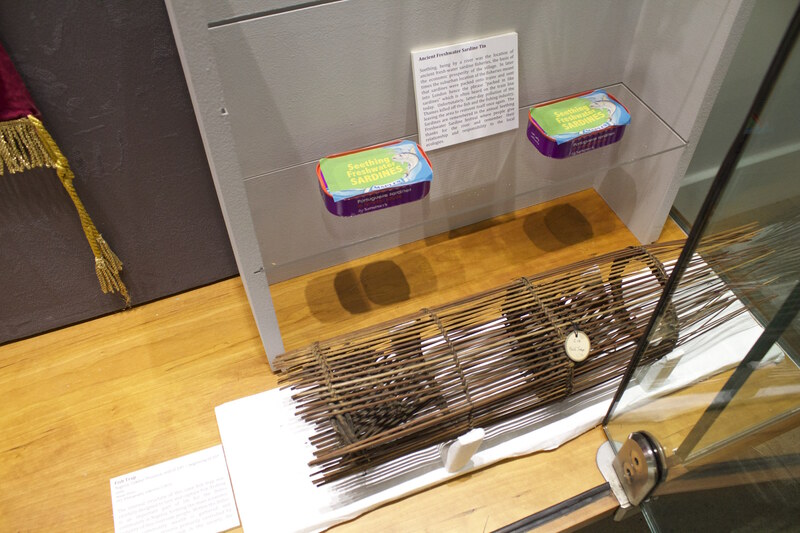 Seethingers were invited to the department and shown the collection of ethnographic objects from around the world. 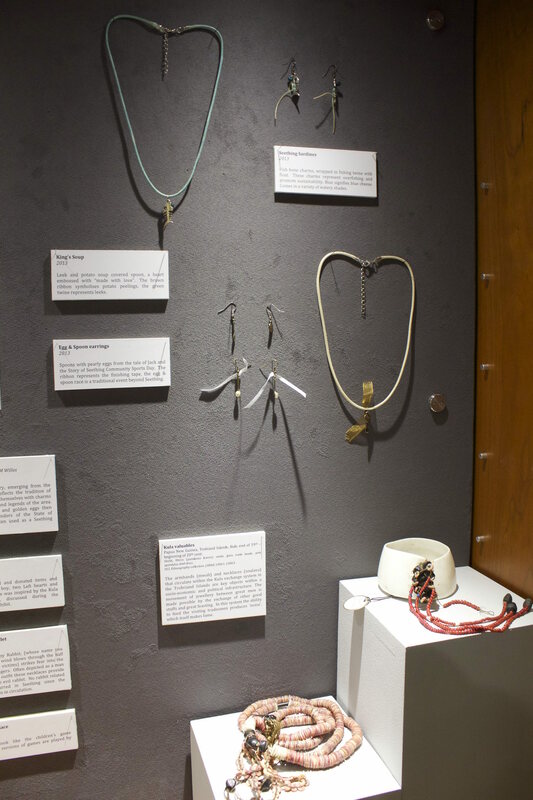 With the help of Nikki Xiao, a UCL masters student, and Dr Timothy Carroll, objects were selected from the collection to match items which Seethingers had put forward as representative of Seething life. The aim was not to find a direct equivalence between the objects but to show how objects may have similar aesthetic properties yet perform different social functions or may perform similar social functions whilst having different aesthetic properties. For example, during the Seething Freshwater Sardine Festival Seethingers gather on the shore of the Thames to watch the Seething fishermen drop a net for fish. Pulling scant catch the Seethingers sing sea chanties as a community and the net is dropped again to a plentiful catch. The fish are then paraded through the streets toward a park where a festival is held, including, first and foremost, the cooking and sharing of sardines. The tale tells of the benefits of living in harmony with the local environment and the collective spirt of a mutually supportive community. In the exhibition the freshwater sardines were represented by Seething Freshwater Sardine tins which were matched with an Ibibio fish trap from Nigeria. Within the Ibibio society, fishing is a primary source of wealth, which is gathered and shared communally. Similarly, Seething jewellery was matched with Kula valuables. Mwali armbands and Soulava necklaces circulate within the Kula exchange system in the Trobriand Islands and are key objects within a socio-economic and political infrastructure. 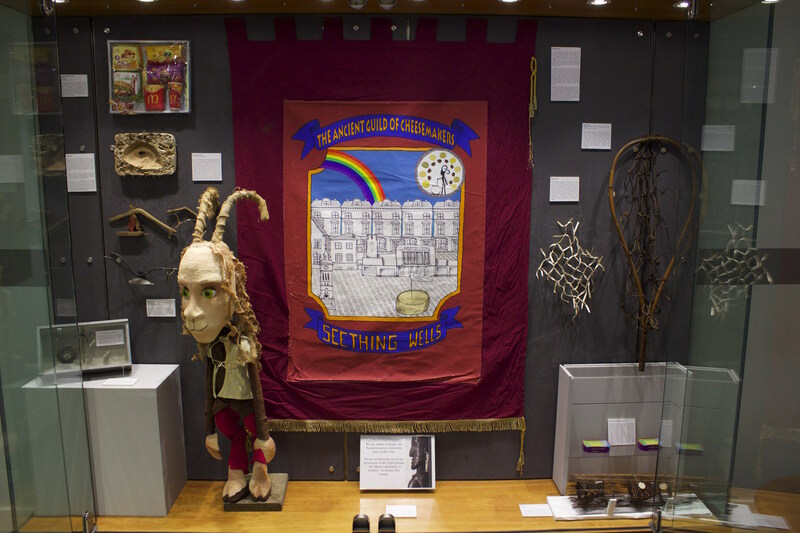 The links to socio-economic infrastructure was also implied through the display of a Seething guild banner. Whilst all the objects were selected for specific aspects and their potential parallelism, some links were clearer than others and the accompanying text was written in such a way as to leave room for the reader to trace their own links between the items on display. The most explicit parallelism was found in the introductory texts setting the tone for the exhibition. The wall texts allowed the reader to make their own associations through the rest of the display. Rather than having only one authoritative introduction to the display two texts were displayed adjacent to each other. One described the exhibition from the perspective of the Seething Villagers and was adorned with the logo and language of the Free University of Seething. The other described the exhibition from the perspective of UCL Anthropology and had UCL branding. The texts purposefully mirrored each other in structure, such that corresponding paragraphs began with the same word and addressed the same themes. Each addressed those themes, however, from their respective institutional perspectives. The parallel texts offered different avenues into the exhibition; they showed the multiple perspectives through which the objects can be viewed, lived and experienced. In this ‘post-modernist’ (see Boast 2011) sense the exhibition emphasised that multiple readings of the display are not only possible but are always at work. The viewer is invited, through the form of display and the content of the accompanying texts, to compare items, ask questions of them, and is presented with a choice of how to read, understand and believe. They are invited into the gap between the objects, between the display and the lived experience and between the various ways these objects as a collection might be understood. They are invited to read, interpret and play with different ways of knowing and seeing, to see the disjunctures, the differences and the similarities between objects and how objects might be seen and understood. This method asks the viewer to see the almost-stupid. This invitation to the viewer shifts the dynamic of the exhibition from one of display as a transfer of authoritative knowledge to one where display acts as a mechanism of play and invites the performative experiencing of both Seething and academic life. Box 1: Accompanying text to Seething Freshwater Sardine Tin. Seething, being by a river was the location of ancient fresh-water sardine fisheries, the basis of the economic prosperity of the village. In later times the suburban location of the fisheries meant that sardines were packed onto trains and sent into London hence the phrase “packed in like sardines” which is often heard on the train line today. Unfortunately, latter-day pollution of the Thames killed off the fish and the fishing industry, leaving the area to reinvent itself once again. The Sardines are remembered in the annual Seething Freshwater Sardine festival where people give thanks for the river and remember their relationship and responsibility to the local ecologies. In 1997, James Clifford used Mary Louise Pratt’s notion of the museum of as a ‘contact zone’ where the contact zone is a “space of colonial encounters, the space in which peoples geographically and historically separated come into contact with each other and establish ongoing relations” (Pratt 1991: 6-7 cited in Clifford 1997:192). The contact zone emphasized the interactive and performative encounter whereby the collection become an “ongoing historical, political, moral relationship – power charged set of exchanges” (Clifford 1997: 192). The concept worked well with a postmodern influenced new museology (Boast 2011: 59) whereby objectifying modes of display were challenged and the performative aspects of material culture as still active in networks of social life and relations came to the fore. However the concept has also been critically analysed by authors such as Boast (2011) who note that the museum is still the place where budgets, forms of display and encounter are worked out. In this sense the museum display and its dialogical ‘contact zone’ is still very much seen by Boast as emanating from a particular position. Through embracing the gap, recognising the multiple positions which viewers of the display may take, Seethingers are able to assert a Seething position, one that brings the viewer into a Seething ‘State of Mind’ by presenting a choice of fact and fiction. The exhibition, like other Seething events, was fun and playful and open to interpretation and imagination. It played with notions of authority through its own institutions (FUS) which formed a dialogue with UCL through a mimicking of its status and a co-opting of its authority into its own social realm thereby highlighting the very politics of the contact zone. The exhibition was also silly and almost-stupid but it was also serious, communicative and inviting. It delivered not simply information but the mechanism of how Seething acts to draw people into its community and how through being almost-stupid it reaches out to the forces around it, such as the cultural imaginary, local government or the academy in order to create new forms of dialogue, expression and new ways of being Seethinger, of being local, of seeing the gaps, the differences and playing in them. Of course such an engagement is possible as Seethingers are deeply aware of how museums operate, curate and display. Surbiton is less than an hour from UCL and many Seethingers regularly visit museums and galleries in central London. Many have worked with such institutions and have attended London’s universities. Furthermore, Seethingers are currently looking at ways to work with such institutions in order to spread and demonstrate its messages of community action. 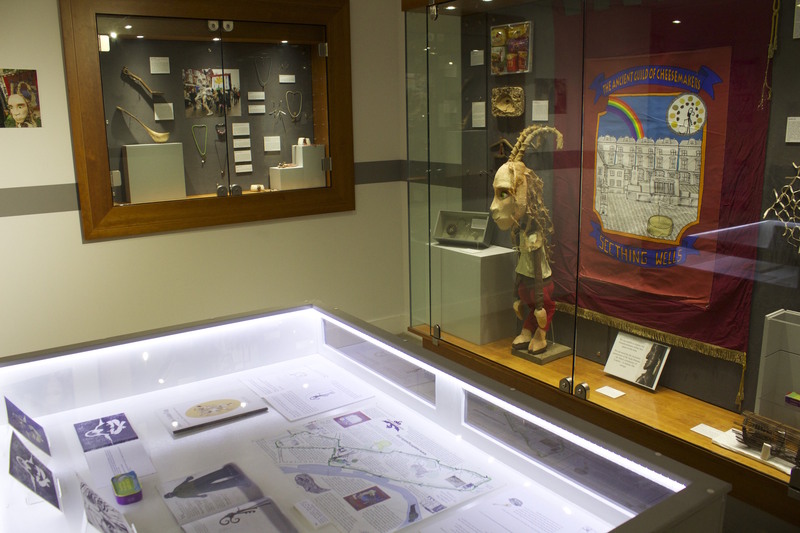 But this particular display was also possible through the ability of UCL to provide space in central London with a small budget and where the Seethingers were invited to play with the form, content and communicative devices in the exhibition. Here the work of ethnography works not so much as to find new ways in which to fill display cabinets in the halls of our academic buildings but rather to offer a way in which informants-as-curators may find new ways to communicate their social worlds through the bridges ethnography can build between different social worlds. Boast, R. (2011). Neocolonial Collaboration: Museum as Contact Zone Revisited. Museum Anthropology, 34(1), 56–70. Clifford, J. (1997). Museums as Contact Zones. In Routes: Travel and Translation in the Late Twentieth Century (pp. 188 – 219). Harvard University Press. Hutchinson, R. (2010a) The Legend of Lefi Ganderson. Seething: Homage Publishing. Hutchinson, R. (2010b) The King’s Soup. Seething: Homage Publishing. Hutchinson, R. (2012) The Last Sardines. Seething: Homage Publishing. Wickstead, H. (2013) “The Goat Boy of Mount Seething: Heritage and the English Suburbs” in (Eds.) Dines, M., Vermeulen, T. New Suburban Stories. London and New York: Continuum. 199-213. London: Bloomsbury Press. Although it is spreading to Swanage (Seething on Sea) and Oldenburg in Germany amongst other places. FACT is shouted after such assertions at Seething events FACT. This expression is to be found on Seething t-shirts which declare ‘I live in seething, it’s a state of mind’ which also plays with the word and meaning of State in a geographical sense.